Metropolitan Hilarion of Volokolamsk, chairman of the Moscow Patriarchate’s Department for External Church Relations, sent a message of greetings to the organizers and participants of the conference which is taking place in Sofia, Bulgaria, and is dedicated to the 700th anniversary of the birth of St Sergius of Radonezh. The text of the message is given below. Next year, the Russian Orthodox Church and the whole Orthodox world will be celebrating a momentous date – the 700th anniversary of the birth of St Sergius of Radonezh. St Sergius, “the hegumen of the Russian land”, as he is called with love and reverence in Russia, Ukraine and other countries of the Moscow Patriarchate, had a great influence on the development of spiritual life of the Holy Rus’. His influence goes beyond the historical period he lived in, or the borders of Russia. St Sergius was known in Constantinople, on Mount Athos and in the Bulgarian Tsardom; he was venerated by St Cyprian – a great son of the Bulgarian people, who was the head of the Russian Orthodox Church at that time. The epoch of St Sergius of Radonezh was a time of true flowering of the Slavic Christian literature inspired by the works of Patriarch Euthymius of Tŭrnovo. It was a time of the ‘Orthodox Renaissance’ which affected Russia as well. Among those who were being sent to the Holy Mount Athos from Russia was St Sergius’s favourite disciple, St Athanasius, hegumen of the Vysotsky Monastery in Serpukhov. 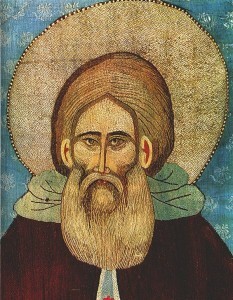 During his visit to Mount Athos, Hegumen Athanasius met with the Bulgarian scholarly monks and received valuable manuscripts. The Bulgarian church tradition and the tradition established by St Sergius continued to intertwine in the centuries that followed. Many eminent hierarchs of the Bulgarian Orthodox Church used to come to the Moscow Theological Academy in order to deepen their knowledge in theology. The Academy is located in the Laura of the Holy Trinity and St Sergius and has been carrying out its activities under his heavenly protection. The Bulgarian archpastors are always welcome at the abode of St Sergius, and his prayerful intercession helps them perform their ministry in the homeland. New generations of students from the Bulgarian Orthodox Church follow in their steps and come to study at the Moscow Theological Schools. I cordially greet the organizers, participants and guests of the conference dedicated to the historic date which is significant both for our Churches and people. I wish you inspiration and fruitful work.